English Language teachers interact with learners from a wide range of backgrounds and abilities. English Language teachers interact with learners from a wide range of backgrounds and abilities. During their training, teachers usually discuss how to address the needs of learners according to their ages, proficiency levels, cultural backgrounds, and the teaching context. However, language teachers rarely receive specific training or in-class support for working with learners with learning disabilities. Some institutions are prepared for students with physical limitations. For example, a school might provide a desk that is accessible for a learner in a wheelchair, or a school may send a sign-language interpreter to class with a learner with hearing limitations. However, institutions – and certainly teachers – are less often prepared to work with students who have diagnosed learning disabilities. Learning disabilities or disorders are described as "difficulty with certain skills such as reading or writing in individuals with normal intelligence. Learning disorders affect the ability to interpret what one sees and hears or the ability to link information from different parts of the brain” (Webster’s). There is not much research that offers suggestions for teaching language learners with such disabilities. As a result, teachers and institutions around the world are left to figure out on their own how best to teach students with learning disabilities. In addition, it is challenging to identify a language learner with a learning disability. Given the lack of research and established guidelines, it is safe to assume that institutions and teachers have little guidance in determining whether a language learner is struggling with learning the language or actually has a learning disability. Therefore, institutions and teachers must do the best they can in making referrals, seeking out diagnoses, accommodating needs, and teaching the language to all language learners. This month’s Teacher’s Corner offers resources and suggestions for teachers who have students with disabilities in their classrooms. Week 1 presents the concept of Universal Design for Learning and the principles that make lessons more accessible to all learners. 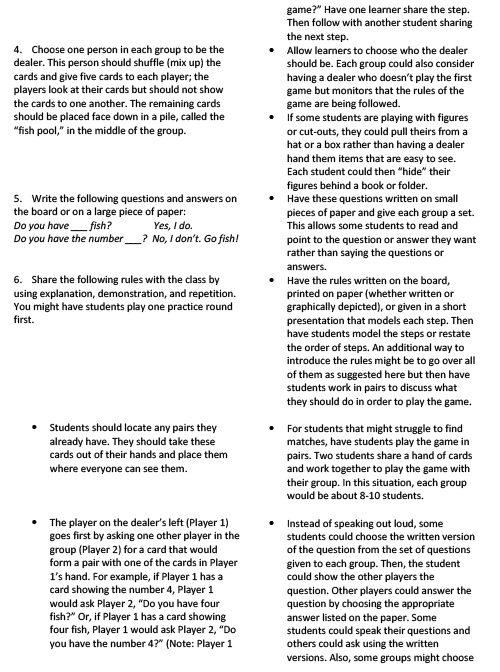 To follow up, Week 2 evaluates an existing lesson plan in terms of universal design. During Week 3, readers learn how teaching self-regulation can help all language learners, including those with learning disabilities. Finally, Week 4 presents a phonological awareness activity that supports language and literacy acquisition for all language learners. Webster's New World Medical Dictionary, 3rd ed., s.v. “Learning disability,” Boston: Houghton Mifflin, 2008. Universal Design is a concept from the field of architecture (TEAL 2017. The idea is that when buildings and their many components are well-designed, they are functional and accessible for people of all abilities. One of the most common examples of this concept are automatic doors. Doors that open automatically are designed to create an accessible entrance and exit for people with physical disabilities. However, everyone benefits from the convenience and ease of an automatic door, from people carrying their groceries in both hands to parents pushing strollers. In recent years, the field of education has borrowed this principle of universality and applied it to the classroom and learning. The idea and intent behind Universal Design for Learning (UDL) is to plan and use curricula that best serve all learners regardless of their abilities and backgrounds (TEAL 2017). In this week’s Teacher’s Corner, teachers learn more about UDL and consider how its principles apply to the language-learning classroom. Be sure to return for next week’s Teacher’s Corner, when we follow up with a lesson plan and specific questions and adaptations necessary to implement UDL. Many organizations and institutions have taken up the idea of using Universal Design in the education setting. These groups have provided foundational information for understanding the concept, and they share a number of principles for UDL and a variety of suggestions for implementing these principles. Using information from CAST, an educational research group, and the TEAL Center, a project of the U.S. Department of Education, we present a brief overview of the principles of UDL. Can learners engage with the material or activity in different ways? How is the content presented to learners? Are there multiple representations of content and input? Can learners act on what they’ve learned or express their understanding of what they’ve learned in a variety of ways? In short, UDL asks educators to diversify how material is presented, how activities are conducted, and how students demonstrate their understanding in order to accommodate and support all learners regardless of abilities (TEAL 2017). In addition, for each of these principles above, teachers should consider how they will include the aspects access, build, and internalize (CAST 2018). For example, within the principle of engagement, we consider the aspect of access: how do students access engagement? They might access it, for example, through having a choice in how they will work through the material: either alone or in groups. The next section offers more specific suggestions using the framework presented here. Teachers wondering how to implement UDL should recognize that the principles outlined above are in line with best practices in teaching and learning. Language teachers are already trained to consider the diversity among their learners and the many elements of English that will challenge a variety of learners. Here are some specific suggestions in terms of presentation and practice (TEAL 2017; CAST 2018). Can learners get their input from other means? Can learners learn the material from other sources, such as distance learning, peers, or field experience? Are there multiple formats for learners to interact with the content? For example, do students have the opportunity to learn from a video, a podcast, or manipulatives? Repeat, summarize, and check understanding. For example, present the material using a summary and then review the presented material with a list. Highlight patterns, clarify information, and offer opportunities for inquiry. Has background knowledge and learner motivation been activated? For example, how can teachers use learners’ background knowledge to prepare and excite them about the activity? In essence, teachers present content in multiple ways so that all learners have the best chance possible to understand the material. Success in understanding will then help students when practicing the material and lead to successful learning. As with presentation, students need a variety of ways to engage and practice the target language skill. Learners must be able to show what they can do with the language in a way that best supports their abilities. How does the lesson incorporate opportunities for hands-on learning, role-plays, music, etc.? Can learners show their work and learning through multiple ways? For example, for those that excel at speaking, can they do a short presentation to a group while other learners show their understanding through a graphic organizer? How are language learning and learning strategies encouraged and developed? What opportunities are developed to encourage authentic practice and use of language? Ultimately, consider the vast array of best practices in language learning and expand those further to incorporate the principles of UDL. These principles complement and add to language learning practices while supporting all learners in the language classroom. CAST. The UDL Guidelines. Accessed August 31, 2018, http://udlguidelines.cast.org/. TEAL Center. “TEAL Center. Fact Sheet No. 2: Fact Sheet: Universal Design for Learning.” LINCS. Last modified July 6, 2017, accessed October 15, 2018, https://lincs.ed.gov/state-resources/federal-initiatives/teal/guide/udl. Last week’s Teacher’s Corner outlined the principles of Universal Design for Learning (UDL). UDL approaches lessons with learner accessibility in mind and complements other best practices for learning. To summarize, UDL emphasizes presenting information in multiple formats, giving learners a variety of ways to practice the target skills, and developing alternative assessments that fit the diverse learning needs of all learners (CAST 2018). UDL helps all learners by taking into consideration how, why, and what students learn. This week, Teacher’s Corner annotates a lesson plan, offering possible adaptations to make the lesson align more closely with UDL principles. 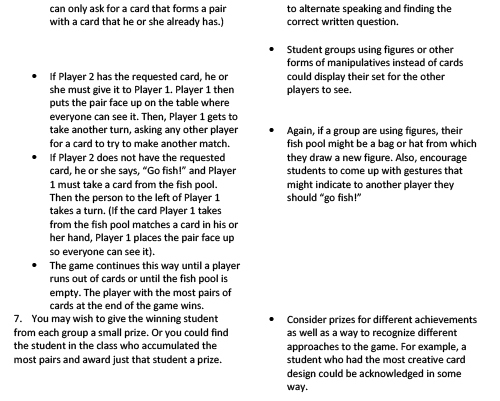 The lesson used comes from English Teaching Forum and is called “Go Fish!” (Ryan 2011). The lesson is reprinted here in its entirety and annotated with UDL suggestions in each section. Note that the annotations throughout the lesson are not an exhaustive list. Instead, the suggested adaptations are just the beginning of possible changes and revisions that any educator could make to this lesson. After reading through the lesson and the suggestions, it should be clear that incorporating Universal Design for Learning principles into a lesson does not take away from the spirit or intended goals of a language lesson. Instead, the UDL adaptations and considerations enhance a lesson and make it more accessible for all types of language learners. Since the late 1980s, second language researchers and cognitive scientists have investigated the role of strategies in learning a language. They agree that explicitly teaching language-learning strategies helps students learn a second language (Kormos 2017). In fact, learners who use learning strategies, such as monitoring and tracking how they learn, tend to succeed more at school than their classmates who do not use such strategies (2017). As a result, it is more important than ever for teachers to consider teaching learning strategies in their language classrooms. This week, Teacher’s Corner explores teaching learning strategies to benefit language learners, both those with and without language learning difficulties. The strategy of self-regulation is particularly important; it refers to how involved a learner is in his or her own learning process (Kormos 2017). The activity presented here gives teachers a simple technique to teach self-regulated learning, which helps learners set their own goals, monitor their own progress, and evaluate their own outcomes. In this sense, learners are involved in their own learning processes and can utilize such learning strategies again in other language-learning contexts. Use this process for any assignment or activity that learners would do in class. The more they incorporate this type of strategy, the more comfortable they will become, and the more likely they will be to use it in the future. This activity will be modeled using an assignment to write a 5-sentence paragraph that summarizes one’s morning routine (see Appendix A). However, any assignment or activity can be used with this process. Tell students that following this activity, they are going to write a paragraph using what they’ve learned about the standards of a good paragraph. Hand out the assignment description and tell students to read through the assignment individually. Have students turn to a partner and explain in their own words what the assignment asks them to do. Bring the class together and ask students to reiterate the steps of the lesson. Ask students to think about what they want to accomplish during this assignment. Have them turn back to their partners and discuss what possible goals they have. Ask students to share some of their ideas; the teacher writes some of these ideas on the board as examples. Give students 5-10 minutes to come up with their goals. As they work, the teacher should walk around to check in with learners and discuss what they write. Give each student a large piece of paper and three different colored markers. Tell students to divide their paper into 3 columns and to write each column heading in a different color. Have students write their three goals (from Step 1) in the first column. How much time do I need to work on this activity? What should I do before I write? Where can I check or ask questions when I need help? How will I decide if every goal is met? When will I know I’m done? What do I need to do to meet my personal goal? What will I do to check that work? Give students time to work individually on an outline of a plan. Tell students to have a plan that follows an order or a checklist. For example, they could create a series of steps: “First, I will… Then, I will…” Or they could create a list of things they want to do that they can check off when completed. Teachers can move around the classroom and check in with students as they work on their outlines. After creating their outlines, students should write their plan in the second column. Once they complete a task listed on their outline, they cross it off the list. Students make notes on their plan explaining what they did and when. After students have finished their plan, they can move on to complete the assignment. When students have finished their assignments, but before they turn them in, have them evaluate their work according to their original goals. Tell students to take out their assignment and their chart. Post the following questions on the board and have students fill in Column 3 with the answers. How does your final work compare to your original goals? Write two sentences explaining your answer. How useful was your plan? Which strategy worked best? Which strategy didn’t work? How would you change your plan for a similar assignment in the future? Where in this process were you most successful? Once students have finished this part of the activity, have them submit the assignment and chart. After the teacher has evaluated and returned the assignment and chart, review the whole process. Reviewing gives students another opportunity to reflect and consider how to support their own learning process in the future. Kormos, Judit. The second language learning processes of students with specific learning difficulties. Routledge: New York, 2017. Include a topic and controlling idea in your first sentence. For example, your topic is your morning routine and your controlling idea is how you describe your morning routine. Is it busy? Is it slow? Is it always changing? The next 4-6 sentences should explain what you do in the morning. They should also show how your routine is an example of your controlling idea. Your final sentence should be a final thought explaining how you feel about your morning routine. The first line should be indented. You should include a title. Your name should be written on the top left-hand side of the paper. Teachers are tasked with many roles in the language classroom. In addition to teaching language, many must also act as cultural interpreters, counselors, disciplinarians, motivational speakers, and more. One task that language teachers may hesitate to take on is diagnosing learning disabilities in language learners. While language teachers are knowledgeable in how a second language is acquired and what techniques support successful second language acquisition (SLA), they are often not trained to diagnose learning disabilities so often connected with language. For example, dyslexia is a learning disability that interferes with the reading process. But what should language teachers do when all language learners inevitably struggle with reading at times? How do teachers know when the barrier to learning is related to a disability and not to the language difference? More likely than not, teachers will not be able to make such a diagnosis on their own. Moreover, even if teachers had the training, their institutions might not have the resources to support the student with a disability. Instead, language teachers should turn their attention to what they do best, and that is teaching the language using bottom-up skills and top-down skills that support all language learners, including those with learning disabilities. This week, Teacher’s Corner offers a familiar reading task that promotes phonological awareness by focusing on decoding and distinguishing between the minimal pair of /p/ and /b/ in the final position of single-syllable words. This type of activity supports language learners with and without learning disabilities. Learners are given opportunities to practice identifying and decoding two letters, linking those letters to their corresponding sounds, and ultimately distinguishing between the two sounds. Each of these skills are the foundation to learning to read and speak in a new language and benefit all learners of a second language, regardless of a learning disability. Make enough copies of the minimal pair word list (Appendix A) for all students. Write the minimal pair word list on the chalkboard or on a large piece of paper to reference. Make copies of the cut-outs of letters (Appendix B) and put each set into three envelopes. 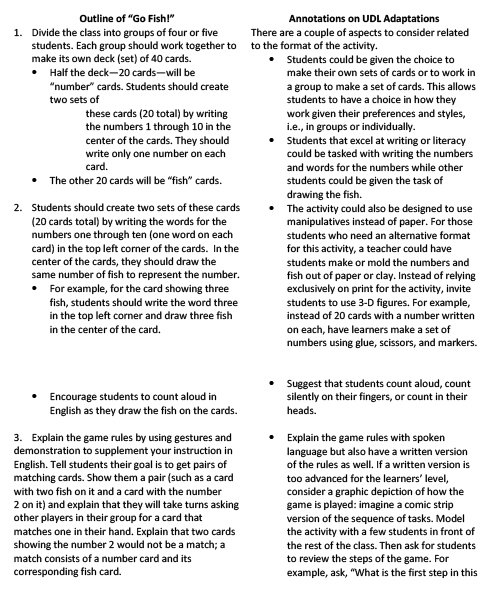 (Make enough sets so that students working in pairs would each get a set). Make enough copies of the minimal pair pyramid (Appendix C) for each learner. Begin class by telling students they will practice reading and pronouncing the letters p and b. Warm up the group by asking students to think of words that have the sound /p/. Ask students to share some of the words and write their suggestions on the board. Repeat the task asking for words with the sound /b/. Circle any of the words on the board that end with the sounds /b/ or /p/. Point to the circled words and ask for volunteers to read them aloud. Explain that today, they will focus on those letters and sounds at the ends of words. Give each student a copy of the word list of minimal pairs (Appendix A). Have students read the words silently. Then, ask one side of the room to circle the words that end in the letter p and ask the other side of the room to circle the words that end in the letter b. When they are finished, have students find a partner from the other side of the room. In their pairs, the students who circled the words ending in p should read each word they circled aloud to their partners. Then, the students switch, and the students who circled the words ending in b should read each word they circled aloud to their partners. When students are finished, bring the class back together as a group and have the p students read their words aloud in unison. Repeat with the b students. Have students return to their partners and ask them to switch papers. Now the students will read the circled words on their partners’ papers. For example, students who read b words before are now reading p words. Once again, bring the class back together and have the students read aloud in unison the words they just read to their partners. Draw the students’ attention to the word list of minimal pairs written on the board. Point to a word, say the word, and have the students repeat the word. Continue through the list, pointing to words and having students repeat the words after the teacher. After going through the list once, go through the list again, still pointing and having students repeat after the teacher. This time, however, change the order of the words. Continue this routine until the teacher can point to a word and the students will say the word without the teacher modeling it. Teachers can speed up this activity as the students get better at identifying the words. Return students to pairs in order to practice putting the words together. Give each pair an envelope of letters (from Appendix B). The other student must read the word that the student spelled. Students return the letters to the envelope and the other student takes a turn. Give students enough time to get through most of the words on the word list. After students have practiced spelling and saying the words, tell them they will now practice listening to the words. Go down the minimal pair word lists, choosing one word from each pair and reading the word aloud. Have students underline the word that they hear. After reading through the list, help students check their work. For each minimal pair, call on a student to read the word he or she heard. If a student has chosen the wrong word, say the correct word again and have everyone repeat the word. Explain to students that now they are going to use minimal pairs to follow a trail down a pyramid. Hand each student a copy of the minimal pair pyramid (Appendix C). Explain that at the top of the pyramid are two words and the teacher will read one. Then students will go to the next set of words stacked under the word they heard. The students should mark the word they hear. If they follow the path correctly, they will end up on the same word as the teacher at the bottom of the pyramid. Go through the pyramid several times. After each trip down the pyramid, ask all of the students which word they should be on. Write the word on the board, and then take students back through the pyramid to see where they heard a word incorrectly. Use the pyramid at the beginning of the next class, or intermittently throughout classes, to reinforce and practice the sounds. For anyone looking to adapt this activity, consider having students work in small groups to read through the lists of minimal pair words as quickly as they can, going around in a circle. Learners who pronounce the /p/ or /b/ sound incorrectly force the game to stop, and the whole group must start from the beginning of the list again. Have groups time themselves to see how long it takes them to get through the lists without making any mistakes. After all groups have finished, ask groups to share their times, and the group with the fastest time wins.